This article is about the professional association. For the television series, see Actors Studio (TV series). The Actors Studio is a membership organization for professional actors, theatre directors and playwrights at 432 West 44th Street between Ninth and Tenth Avenues in the Hell's Kitchen neighborhood of Manhattan in New York City. It was founded October 5, 1947, by Elia Kazan, Cheryl Crawford and Robert Lewis, who provided training for actors who were members. Lee Strasberg joined later and took the helm in 1951 until his death on February 17, 1982. The Studio is best known for its work refining and teaching method acting. The approach was originally developed by the Group Theatre in the 1930s based on the innovations of Konstantin Stanislavski. While at the Studio, actors work together to develop their skills in a private environment where they can take risks as performers without the pressure of commercial roles. As of May 2018[update], the studio's co-presidents are Ellen Burstyn, Alec Baldwin and Al Pacino. The Artistic Director in New York, is Beau Gravitte, and the Associate Artistic Director in New York is Estelle Parsons. After an initial meeting held on October 5, 1947, at the Labor Stage, located at 106 W. 39th Street (formerly the Princess Theatre), in which goals and ground rules of the new organization were discussed, the studio officially opened for business the following day at the Union Methodist Episcopal Church, located at 229 West 48th Street, previously home to the Actors Kitchen and Lounge (maintained to assist actors and others unable to afford meals), and long a source of rental rehearsal space for local theatrical producers. Before settling in its current location in 1955, the Studio moved regularly over an eight-year period: In January 1948, it was a dance studio on East 59th Street. In April of that year, a move to the CBS Building at 1697 Broadway, near 53rd Street, established some semblance of stability; the Studio would not move again until the summer of 1952. From that point, the old Theatre Guild rehearsal rooms on the top floor of the ANTA Theatre became home, as they would remain until October 1954, at which point theatre renovations reduced the Studio to simply renting space twice a week. This it did at the Malin Studios at 1545 Broadway, room 610. This arrangement would persist throughout the 1954–1955 theatrical season, even as the Studio was acquiring and renovating its current venue. In 1955 it moved to its current location in the former West Forty-fourth Street United Presbyterian Church, a Greek Revival structure which was built for the Seventh Associate Presbyterian Church in 1858 or 1859. It was one of the last churches to be built in that style in New York City. From September 1994 through May 2005, the Studio collaborated with The New School in the education of masters-level theatre students at the Actors Studio Drama School (ASDS). After ending its contract with the New School, the Actor's Studio established The Actors Studio Drama School at Pace University in 2006. ^ "Who We Are: Leadership" Actors Studio website. Accessed: May 30, 2018. ^ a b Garfield, David (1980). "Birth of The Actors Studio: 1947–1950". A Player's Place: The Story of The Actors Studio. New York: MacMillan. p. 54. ISBN 0-02-542650-8. ^ Garfield, David (1980). "Strasberg Takes Over: 1951–1955". A Player's Place: The Story of The Actors Studio. New York: MacMillan. pp. 111–114. ISBN 0-02-542650-8. ^ Dunlap, David W. (2004). From Abyssinian to Zion: A Guide to Manhattan's Houses of Worship. New York: Columbia University Press. p. 292. ISBN 0-231-12543-7. 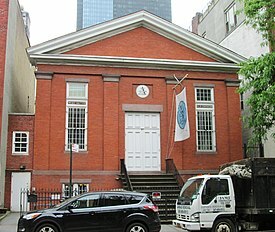 Wikimedia Commons has media related to Actors Studio / 7th Associate Presbyterian Church (Manhattan). A brief history of the Actors Studio, including Lee Strasberg on its origin and purpose.